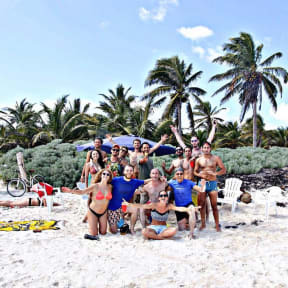 We are the only All Inclusive Hostel in the world and the largest hostel in Tulum. All the drinks and meals are included in the price. All meals are buffets with vegetarian and meat options. Drinks include beer, cocktails and non alcoholic beverages. Please be aware we are a HOSTEL not a HOTEL. If you are looking for a budget All Inclusive Resort this option is probably not for you. Our main goal is to make a place where Good Memories are created every single day. Money Saver Tip: Tulum is expensive, beers are 30-50 pesos and any basic meal in 70-100 pesos at least. Save money by eating and drinking in the hostel before exploring the town. Location: Closer to the Beach than all the other hostels that are in the town. In front of the entrance to most important landmark in Tulum: The Mayan Ruins. Away from the noise of town, surrounded by the beautiful jungle and wildlife. Facilites: We have a huge area where you can find nice spots to chill and read OR spots to have fun and meet travelers. 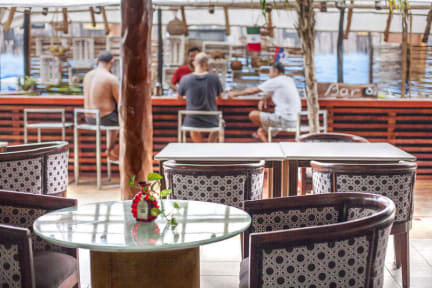 We offer a setup that no other hostels or hotels offer, like a Huge Palapa, Restaurant, a 20 seat Cinema, Pool, Jacuzzi with Hidromassage, Lounge Area with Computer and Printer, Hammocks, Cocktail Bar by the Pool, Free Parking Space, etc. Activities: Daytrips in the mornings to the most beautiful beaches and cenotes. With snacks and drinks provided for free. Beerpong tournaments at night. You get the idea. Explore by day, party by night. WIFI: We take WiFi seriously! We have our own dedicated fiber optics line. Fast and strong WiFi signal in every room and public area of the hostel. Cleanliness: A clean space is a comfortable space. We try our best to have a clean space where you can feel safe, secure and relaxed. Special consideration is given to bathrooms and linens. Dorm or Private, you can request cleaning at any time of day. Dorm beds have a power outlet and reading lamp. Comfortable mattresses, pillows and linens. Every room, dorm or private, has a full bathroom with toilette and hot shower. 6 public bathrooms for general use. Privates have TV with a Netflix. Payment: Cash and Credit Cards Accepted. This hostel is amazing, you will never get what they offer in any other hostel around the world! Come on just with the daily activities, where you get free transportation to amazing places and also you have included the drinks and the food for the activities! Definitely super worth it ! **Please remember this is a hostel and NOT A HOTEL** Hostel are more for backpackers. You should not have the expectations for a hotel. If you’ve never been to a hostel and are open minded to the experience, this is the perfect choice. Free buffet all day long, free water, free daily tours (except the entrance fee with discount sometimes), curtains around the bed for privacy in dorms, nice people. I highly recommend this place. I will come back for sure. Thank you to the staff ! See you soon ! the swimming pool was not really clean. i did not like some people was throwing people inside the pool ( and a couple of them got injured) . the place has a good location and its close to the ruins. i hope it will be better when i come back. My friends and I stayed at this hostel for 2 nights out of our 5 days in Tulum. The staff at this hostel were great and really friendly, but the hostel itself I would not recommend to a friend. The food wasn't good, with barely any vegetarian options (when their online description said they provided it), there was no overnight security and the entrance was wide open to the street, and it wasn't in the most ideal location for us. This hostel feels like it has potential but needs help. Endless drinks were cool, art was beautiful. Chill staff, but food was covered in flies, bathrooms had brown tap water, dead bugs stayed on the floors for days (so no one sweeps here), got attacked by bed bugs. Location is too far from town. This place has potential if they just had a cleaning crew come in at least once a day & if they replaced all the nasty matttesses & chairs. Did not enjoy my visit. Nicht weiter zu empfehlen! Das stets kalte essen muss mit schmutzigem, nassen Geschirr und Besteck gegessen werden. Bei den „Fahrrädern“ hat man Glück wenn man ohne Platten am Ziel ankommt. Die Handtücher und Trinkbecher sind schmutzig und die Bar lässt ebenfalls zu wünschen übrig ..